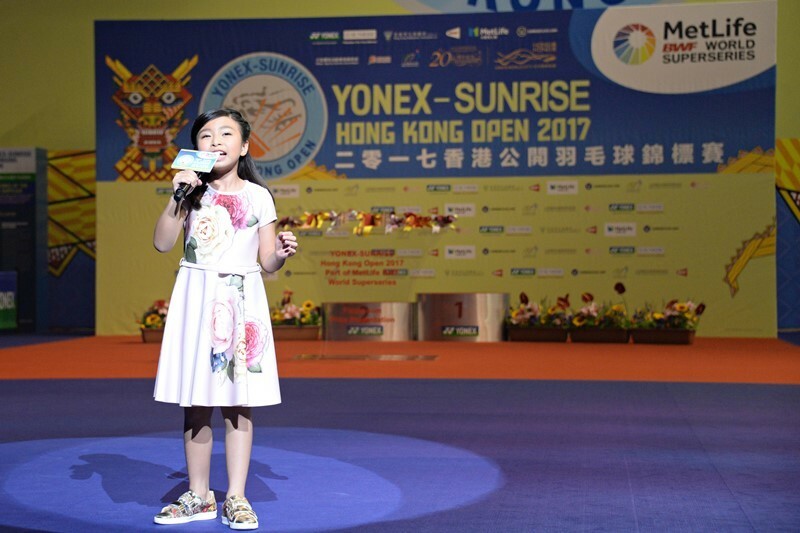 ‘America's Got Talent’ finalist Celine Tam Tsz-kwan performed at the opening ceremony of YONEX-SUNRISE 2017 Hong Kong Open Badminton Championships today (26 November) at the Hong Kong Coliseum before the finals commence. Dr. Tong Yun Kai, President, Hong Kong Badminton Association co-officiated at the opening ceremony with Mrs. Betty FUNG, Permanent Secretary for Home Affairs, Mr. Timothy Fok, President of the Sports Federation and Olympic Committee of Hong Kong, China, Mr. Poul-Erik Hoyer, President of Badminton World Federation, Mr Kho Kai Hwa, Sunrise and Co. (Pte) Ltd, Mr. Lee Wood, Chief Executive Officer, MetLife Hong Kong and Mr. Tong Wai Lun, Chairman of Hong Kong Badminton Association. The officiating guests kicked off the event with fireworks effect at the ceremony. The organizer also invited the ‘America's Got Talent’ finalist, 10 year-old Celine Tam Tsz-kwan to performed a Cantonese pop song and "My Heart Will Go On" for the spectators before the exciting finals starts. Mr. Tong Wai Lun presented souvenirs to Mr. Poul-Erik Hoyer and Mr. Lee Wood to express his gratitude to the sponsors.